Click on 'More info' to see more pictures and to check availability on any of our listed Bramhall cottages. Click 'Add to favourites' to store any of the Bramhall cottages for later viewing. Beautiful detached stone barn with interior exposed beams set in a picturesque farmyard in the Peak District National Park right on the Derbyshire/Che.. These days, it is important that we all reduce our environmental footprint, but we still want to have lovely holidays - at Top Eccles Farm Eco Barn yo..
Set in the beautiful countryside of the Peak District National Park, the Garden Flat is part of a large country mansion built in 1861 by a local famil..
Set in the beautiful countryside of the Peak District National Park, Moorfield Lodge is part of a large country mansion built in 1861 by a local famil..
Set in the beautiful countryside of the Peak District National Park, The Old Billiard Room is part of a large country mansion built in 1861 by a local..
Grade II Listed traditional farm building incorporating oak beams and stone flagged floors. Set on a small working farm on the edge of the Peak Distri..
Two Grade II Listed traditional farm buildings incorporating oak beams and stone flagged floors. Set on a small working farm on the edge of the Peak D..
Open the windows and look out onto the world! Situated in Flash, Britain’s highest village, the first floor properties have superb views over the s.. Situated in Flash, Britain’s highest village, the first floor properties have superb views over the surrounding countryside, while the ground floor .. Enjoy breathtaking scenery in the heart of the Peak District. Visit Chatsworth house, Haddon Hall, Bakewell & Castleton. Ideal for walking on the high.. 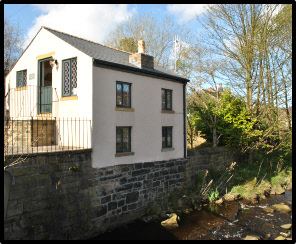 This 200 year old quaint, cosy cottage is in a lovely hamlet in the picturesque Peak District. The cottage is adjacent to a lovely country pub.. The Old Cobblers self-catering holiday cottage is set in the heart of Marsden village, opposite the impressive St Bartholomew’s Church. It is 5 minu.. The property is a converted barn dating from the 19th Century with magnificent views of the Hope Valley from virtually all rooms. Short breaks bookings accepted these can commence on either a Monday for four nights or Friday for three nights only. E-mail wolfscote@btinternet.co..
Short breaks bookings accepted these can commence on either a Monday for four night or Friday for three nights. Overlooking the Dove Valley amon..
Short breaks bookings accepted these can commence on either a Monday for four nights or a Friday for three nights . Please e-mail wolfscote@btinternet..